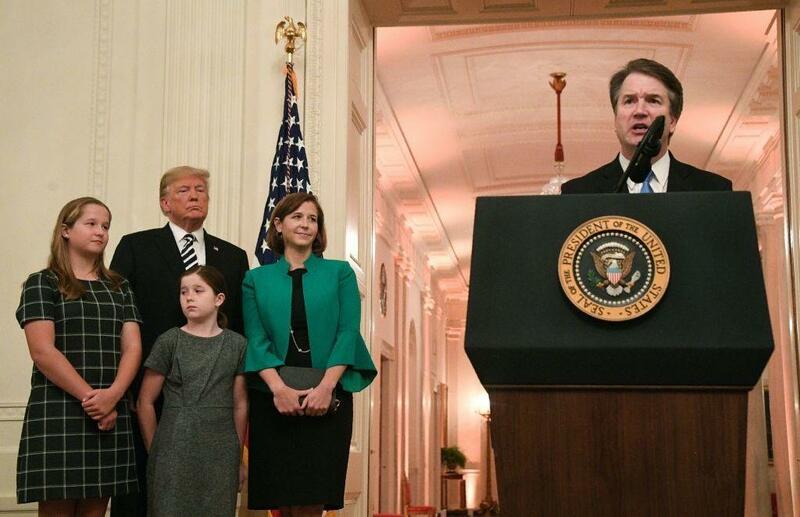 Newly sworn-in Supreme Court Justice Brett Kavanaugh speaks as his wife, daughters and President Trump listen on Monday. "The Supreme Court is an institution of law. It is not a partisan or political institution," Kavanaugh said. "The Supreme Court is an institution of law. It is not a partisan or political institution," Kavanaugh said. "The justices do not sit on opposite sides of an aisle. We do not caucus in separate rooms. The Supreme Court is a team of nine, and I will always be a team player on the team of nine." Trump, however, began the ceremony with a sharp partisan rebuke. "On behalf of our nation, I want to apologize to Brett and the entire Kavanaugh family for the terrible pain and suffering you have been forced to endure," Trump said. "A man or a woman must always be presumed innocent, unless and until proven guilty," the president added, to applause in the White House East Room. "And with that, I must state that, you sir, under historic scrutiny, were proven innocent." "Although the Senate confirmation process tested me, as it has tested others, it did not change me," the justice said, affirming that he's committed to fairness and impartiality on the bench. But the rancor left from his confirmation battle was on display Monday morning on the street outside the court, where several dozen protesters chanted, "Hell, no, we don't support sexual predators on the court." Kavanaugh is getting off to a swift start. He has already hired four women to serve as his Supreme Court clerks, something that he noted Monday evening was a first, and has studied the legal briefs for the cases on deck. Those center on which kinds of crimes trigger mandatory prison terms under the Armed Career Criminal Act. Any technical arguments are likely to be overshadowed by Kavanaugh's first public appearance wearing the traditional black robe donned by Supreme Court justices. The bruising campaign to install Kavanaugh onto the court could leave a mark on his reputation and on public confidence in the institution, legal experts say. The former dean of Yale Law School, from which Kavanaugh graduated, wrote he was "shell-shocked" by the judge's forceful testimony denying sexual assault allegations and decrying what he called a concerted effort by liberal enemies, including the Clintons. "For as long as Kavanaugh sits on the court, he will remain a symbol of partisan anger, a haunting reminder that behind the smiling face of judicial benevolence lies the force of an urgent will to power," Yale law professor Robert Post wrote in Politico. "No one who felt the force of that anger could possibly believe that Kavanaugh might actually be a detached and impartial judge." Kavanaugh's allies predicted the partisan air around his confirmation would fade. They point out he served for 12 years on the country's second-most important court, the U.S. Court of Appeals for the D.C. Circuit, where he penned more than 300 opinions, many of which were upheld by the Supreme Court. "These things always blow over," Senate Majority Leader Mitch McConnell said in a news conference shortly after Kavanaugh won confirmation. The justices themselves have expressed concern in recent years about public perception of the court. "This is a really divided time," said Justice Elena Kagan, who addressed the current climate of the court at an event at Princeton University last week. "Part of the court's strength and part of the court's legitimacy depends on people not seeing the court in the way that people see the other governing structures in this country." Chief Justice John Roberts has made keeping the court above the partisan fray a priority in his tenure. Roberts addressed that issue in 2017, in remarks at Rensselaer Polytechnic Institute. "It is a real danger that the partisan hostility that people see in the political branches will affect the nonpartisan activity of the judicial branch," he said. "It is very difficult I think for a member of the public to look at what goes on in confirmation hearings these days, which is a very sharp conflict in political terms between Democrats and Republicans, and not think that the person who comes out of that process must similarly share that partisan view of public issues and public life." Now to the Supreme Court, where this morning protesters had a message for the newest justice. UNIDENTIFIED PROTESTORS: (Chanting) Hey, hey, ho, ho, Kavanaugh has got to go. Hey, hey, ho, ho, Kavanaugh has got to go. KELLY: Only days after the Senate voted narrowly to confirm him, Brett Kavanaugh made his first appearance on the high court bench. NPR national justice correspondent Carrie Johnson was watching the oral arguments, and she's here now to tell us about them. Hey, Carrie. KELLY: So we heard the protesters outside the court. What was it like inside today? JOHNSON: Well, after all the rancor of Brett Kavanaugh's confirmation hearings in the Senate, things were quiet inside the court - no disruptions, no arrests. Kavanaugh's wife, Ashley, was there. His two daughters skipped school to attend. Retired Justice Anthony Kennedy was there, too. Of course Kavanaugh replaced him on the bench. And at the start of the day, Chief Justice John Roberts said, it gives me great pleasure to welcome Justice Kavanaugh to the court. And Roberts wished him a long and happy career. KELLY: He has been busy already. He has hired four clerks, all of them women, I will note. We're told he spent the weekend reading up on cases. Did he actually speak much from the bench today? JOHNSON: He was really active for his first day on the job. I counted more than 10 questions from him to both sides, mostly technical questions about the state of the law. The court today heard two cases about what kinds of crimes should trigger the Armed Career Criminal Act. Congress passed that law to take dangerous people off the street. It sends them away for mandatory prison terms if they have prior violent crimes in their past. The question for the court today was whether certain kinds of robberies or burglaries counted or not. KELLY: Sounds like neither of those cases today are ones with big political or ideological divides. But when are cases going to come before them that would test this new 5-4 makeup of the court? JOHNSON: Yeah, the docket is not super-polarized so far, but there's a good chance the high court will consider whether to accept some cases that could wind up being blockbusters, cases that, say, have to do with President Obama's DACA immigration plan, cases that might pit religious liberty against the rights of LGBT people or cases about the power and reach of the executive branch. At least one of the justices today appeared to be playing a long game. That's Elena Kagan. She was appointed by President Obama, but she and Brett Kavanaugh go back a way. She hired him to teach at Harvard Law School when she was a dean there. They behaved very warmly together today, laughed a lot. And he shook her hand as he left the bench. The issue is whether she is trying a charm offensive on this new justice to get him to be a more moderate figure on this bench over time. KELLY: But what about the fear that Brett Kavanaugh's confirmation battle was so partisan, was so rancorous, I think is the word you used, that there would be this cloud of partisanship hanging over him and hanging over the court? Did you see any sign of that? JOHNSON: Not in the courtroom today. Brett Kavanaugh of course introduced some of this himself in the Senate when he mentioned an organized campaign to go after him, even citing the Clintons. He spoke Monday night at a ceremony at the White House, saying he wanted to be impartial and fair and part of a team of nine justices on the court. But Kavanaugh also went out of his way at that event at the White House to thank Senators who made the difference in his confirmation, people like Susan Collins of Maine and Joe Manchin of West Virginia. And President Trump did not help matters when he said Kavanaugh had been proven innocent of assault allegations. That actually did not happen. The president also apologized to Kavanaugh Monday for what he called the terrible pain and suffering you have been forced to endure in this campaign to get on the bench. There was no hint of any of that in the Supreme Court today. KELLY: A very different story inside the Supreme Court it sounds like. Thanks very much, Carrie. KELLY: That's NPR's Carrie Johnson. Transcript provided by NPR, Copyright NPR.